Home/Teddy Highlight/Woolmark – It’s Official. Great excitement in the Teddy camp this week – we have officially received the Woolmark certification for our teddy bears! We didn’t think 2018 could get any better………but it did……. when we were contacted the AWI’s (Australian Wool Innovation) Manager of Australia and New Zealand, Stephen Feighan, asking us about our products we started getting a bit hopeful. Early in the year, as part of our reflection over the past twenty-five years we wrote a blog on the efforts and the knock back the business founders had when they tried to secure the symbol in the late 1990s. Determined to have another attempt at acceptance, we submitted an application in May and were again knocked back. Reason being, ‘there is not a huge demand to have these specific items Woolmark certified, hence why there is no current specifications available.‘ But we could get our sheepies and slippers certified, which we decided wasn’t really worth the expense. So we were understandably excited when Stephen contacted us in September after reading our blog to tell us he was ‘keen to see how we can get Woolmark associates with Tambo Teddies’. 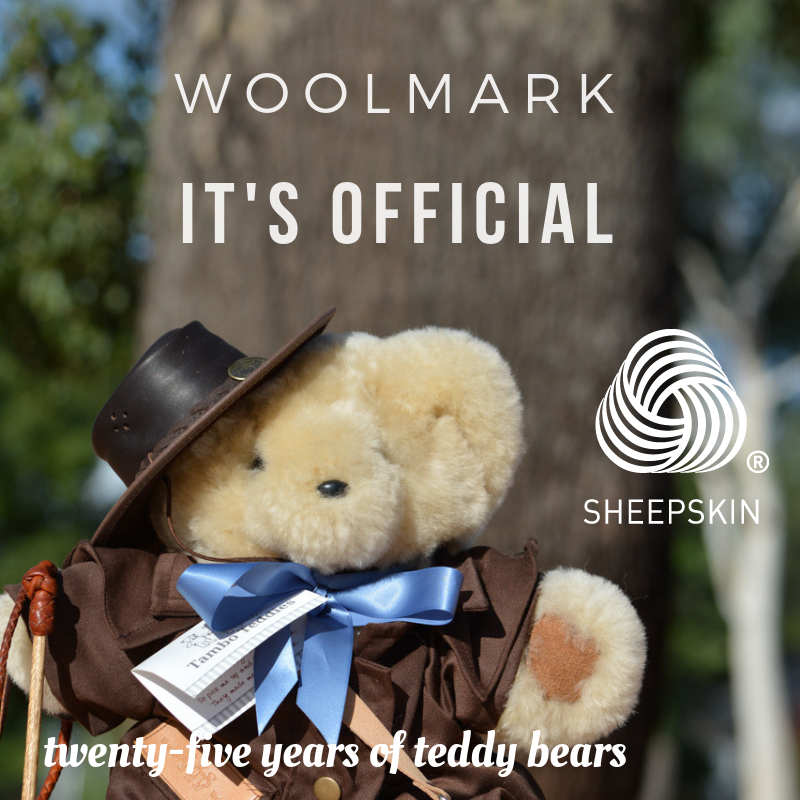 Yes – the Woolmark wanted to be associated with us – Tambo Teddies and our sheepskin teddy bears. Dreams come true, our bears were tested, AWI representatives visited and yes – ‘It’s Official’ – we have Woolmark certification for our beautiful sheepskin teddy bears. The Woolmark logo is one of the world’s most recognised and respected brands, providing assurance of the highest quality, and representing pioneering excellence and innovation from farm through to finished product. Certainly sounds like some teddy bears we all know and love!